I felt I had to quickly review another Carmenére since I gave the last one such a poor review, so here it goes. 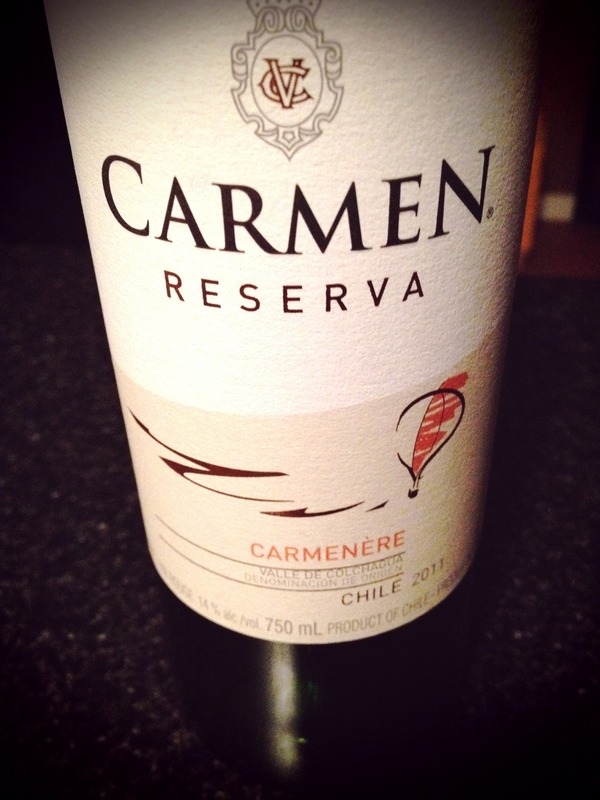 First let me say this, the Carmen Reserva Carmenére was one of the better, affordably priced, Carmenére’s that I have had, in a long while. This one comes from Chile’s Carmen Wines, who ironically just gained the accreditation ‘Sustainable Wine of Chile Certification’. This Carmenére is an obvious red wine, that I would class as medium bodied. It has great fruit flavours, but with a good balance of tannins and acidity. This is a wine with a bit of complexity, meaning when you go back to it for another sip, you’ll discover something else about it’s taste. As an aside, and although very few would go for this, if you are a cigar smoker at a wine party, I bet you this would pair well. While drinking this Carmenére, a few sips in, I sensed an oaky tobacco feel, leading me to think that a cigar and this Carmenére, may make for an interesting match. This is definitely on my buy list and what’s more, falls into the class of wine one could introduce to a group of people with varying wine experience.